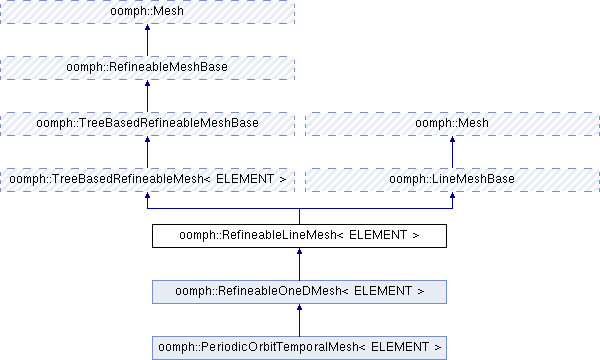 Intermediate mesh class that implements the mesh adaptation functions specified in the RefineableMesh class for meshes that contain the refineable variant of QElement s [The class ELEMENT provided as the template parameter must be of type RefineableQElement<1>]. Mesh adaptation/refinement is implemented by BinaryTree procedures and any concrete implementation of this class needs to provide a BinaryTreeForest representation of the initial (coarse) mesh. Definition at line 53 of file refineable_line_mesh.h. Constructor: Set up static binary tree data. Definition at line 60 of file refineable_line_mesh.h. Definition at line 68 of file refineable_line_mesh.h. Definition at line 80 of file refineable_line_mesh.h. Definition at line 74 of file refineable_line_mesh.h. Set up BinaryTreeForest. Wipes any existing tree structure and regards the currently active elements as the root trees in the forest. Definition at line 91 of file refineable_line_mesh.h. Referenced by oomph::RefineableOneDMesh< oomph::SpectralPeriodicOrbitElement< NNODE_1D > >::RefineableOneDMesh(), and oomph::RefineableLineMesh< oomph::SpectralPeriodicOrbitElement< NNODE_1D > >::setup_tree_forest(). Set up the tree forest associated with the Mesh. Forwards call to setup_binary_tree_forest(). Definition at line 84 of file refineable_line_mesh.h.